I'd like to try that build, but I'm a bit concerned whether I reallly have a U30GT2 ? In the system it only shows U30GT, but it has 3188 chip not 3066 according to CPU Checker, but i.e. Antutu also reports it as U30GT (Rating ~15000). Any clue how to verify ? 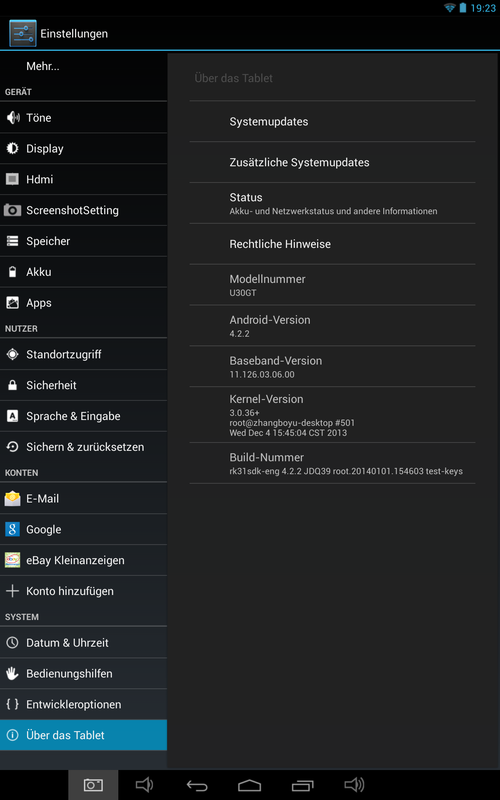 Maybe check in Settings / About tablet and see if kernel version and build number match one of an existing firmware we have in the U30GT2 forum section. Last update can be found in post #1, the keyboard issue is hopefully fixed. Hmm so right now there is a persistent keyboard problem, and its rejecting the workaround. Perhaps Admin needs to do another fundraising drive to get arctablet a Cube to work on. With 4.4.3 out and who knows probably 4.4.4 or maybe 5.0 in the future it would be good for us users to get a Cube in their hands or even DarthJabba's able hands. If we can agree I'm willing to pony up the first $30 or $40 dollars to keep my cube going and up to date. What say you folks? And will Admin or Darth agree if we can come to a consensus on this? EBay has a few going for less than $250US. I saw one going for $219US. I know the tab is going on two years now but frankly I just haven't seen another with these specs at the price its going for in the past and now. Yeah we can all upgrade to IPads or Surface or whatever, but personally I just haven't got that kind of money and my cube is in pristine condition. If I can keep the operating system up to date for a few more years I'm willing to invest in keeping it going! I agree that the Cube, if well assembled, represents excellent value - as long as one doesn't mind having to flash new ROMs. Cube U30GT2 has RK903 wifi. Couldnt find any reference to this fw, just in conjunction with some neo tablet, but first thing I did was rooting, thus kernel is probably different anyway. my cube30gt2 tablet keeps getting slower. Afther a factory reset its fine for a period of weeks (i dont use it every day) but in the end it drivin me mad. I want to flash the new KK firmware in post1, hopin this will solve my problem. btw:Do i need to flash the KK build from post 20 ?, or is the version in post1 fine ? edit:flashed it, works fine for now, hope it stays this way. Pardon me Oma, so this is the new edition of the same rom Admin put together from the Chinese developer? I downloaded the rom but I want to make sure before flashing my cube. Any special instructions if we already have the last kitkat by kasty. Do we have to do the instructions as posted with your creation? Thanks for all your effort by the way! The build is not from cube. And that's what I'd like to see how good it works on the U30GT2. The postet kernel is from the kasty build in post #1. If you are on the kasty build you already have the v2.10 loader running. It's only mandatory to change the loader first if you are switching between JB and KK builds. On the other hand, the custom firmware that Oma has just published is something totally fresh and is not based on stock firmware by Cube. So it's done for evaluation as Oma said, given time and some tweaking it may even work better than Cube's releases... I think it's hard to be certain of the result so we shall see how this evolves. While we still need support to continue running our site here (we have hosting and other costs everything month) it is totally fine to distribute the donations of those willing to help DarthJabba and/or Oma to acquire a CubeU30GT2, helping both was already done once with transferring some small donations we received. Let's first check interest from forum members on this project here then we can work out the details. I found references somewhere on the internet that Cube is currently testing KK on the GT2. Would it make send to wait for that and ease developer's life ? If I am not mistaking, Cube has already produced 2 KitKat firmwares for the U30GT2. "Please report any problem with this firmware, I can't verify this custom firmware works as I don't have anymore a Cube U30GT2 tablet to test the custom firmware."